I was hoping to save this until it was posted at Topps but not knowing if that will actually ever happen having received no reply in the 2 weeks since submitting, I thought it only fitting that I share it with my regular readers first anyway. This is not MY 1975 Topps #223 Robin Yount rookie card. No, that card and the rest of my childhood collection are long gone. However, I have no one to blame but myself. My Mom (who still picks up cards for me at garage sales despite me being 39 years old) would never in a million years, have thrown away my baseball cards. No, instead I sold Mr. Yount’s rookie card as well as those of Ryan Sandberg, Tony Gwynn, Wade Boggs and countless others, to pursue more whimsical, but adult-like, experiences. That is, if you can call spending a summer following the Grateful Dead across the country adult-like in any way. I acquired MY Yount rookie card at a garage sale in 1978. It was purchased, ironically enough, from a lady at a garage sale, selling her son’s things, as he had recently left home for the Army. Being from Chicago, I didn’t have any fondness for the Milwaukee Brewers. 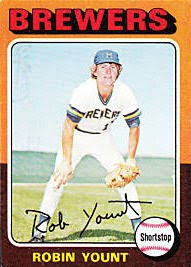 I didn’t even know who Robin Yount really was. But there was just something about that card that captured my attention. I don’t know if it was the picture of him seemingly taken on a football field and looking very out of place or the innocent, childish grin on his face. Whatever it was, I loved that card and certainly knew better than to put it in my bicycle spokes as my father had done with his cards. Little did I know at the time that Robin Yount would go on to have a Hall of Fame career, with a 2.85 lifetime BA, 3,142 Hits, and 2 MVP awards. I was aware when I sold it though. I began to feel guilty about it almost from the time I left the dusty, long now out-of business baseball card shop, in some strip mall not far from my childhood home. I felt cheated. Not because I wasn’t given a fair price by the owner, but instead because I let my childhood disappear for something as fleeting as currency. Or so I felt every time I thought about that card. Flash forward 25-years to 2001 when I re-engaged the hobby of my youth and despite the glitz and glitter of the new era of cards with autographs and uniform swatches, I knew I had to re-acquire MY card. I have, although I know it isn’t mine in the original sense. However, a small piece of my missing childhood has been restored and life is good.